Daily, miners risked their lives underground either singly, in accidents like coal falls or clashes with machinery, or in the fires and explosions that plagued the methane-rich Pictou coalfield. A family lived in dread of the injury or death of their loved one, often the breadwinner. While miners worked without fear, they were ever alert for a sound or smell that could presage danger. From the mining brotherhood came the Acadia Rescue Corps, mine commandos that became famous for their skill and courage in disasters. 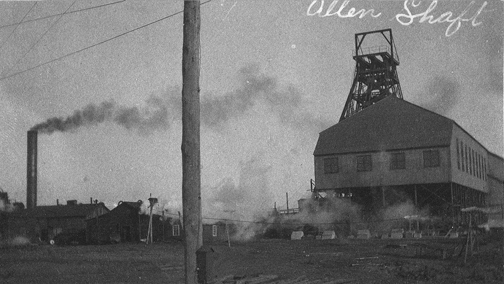 Every mine that opened in Stellarton between 1827 and 1880 ended in fire or explosion. The ruins of the Cornish pumphouse remain as a monument to 44 men killed when the state-of-the-art Foord pit exploded in 1880. 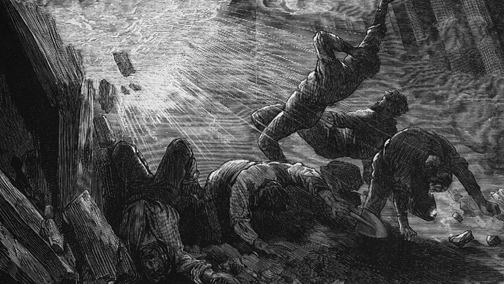 In Westville, an explosion at the Drummond mine in 1873 killed 60 men and boys. "The shock was felt for miles... Dense volumes of smoke coming up the slopes... buildings shattered. The high brick air stack was blown down... Some men had been taken up by the horse gin, alive, but badly burnt... I saw Edward Burns, and Abraham Guy... descend ...as volunteers. ...suddenly (another) terrible explosion followed, blowing up debris probably hundreds of feet high into the air, carrying away in its fury, the gin, and all the gearing of the shaft head, and as we ran for our lives, the debris fell all around us... After the blast was over, we found poor Burns dead, about 20 yards from the shaft, frightfully blackened and mangled..."
Tragedies, yes, but these disasters were the impetus to improved safety legislation. The first all-Canadian craft union, the Provincial Workmens' Association, began in Springhill in 1879. Founder and Grand Secretary Robert Drummond moved PWA headquarters to Stellarton in 1882, where he spearheaded the fight for mine safety, and published the Trades and Labour Journal. 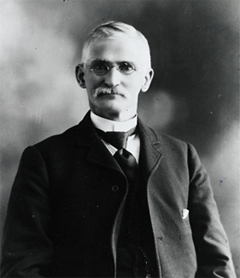 He was mayor of Stellarton, 1899-1900. "But we have succeeded by persistent and well-directed energy in securing night schools, free mining schools, Relief and Aid Societies, certificated officials, manager and miner, certificated engine men, and abolition of garnishee." On April 2, 1914 several outside workers at the Drummond had come into the warm boiler room to eat their lunches. They were sitting directly above No. 5 boiler when it blew up, killing 7 men. "When an accident happens in a mine, they start blowing the whistle. They keep blowing that whistle, maybe for half an hour. Everyone starts running to the mine; thousands of people gather. Because everybody had neighbours or relatives down that mine." "If a man had an accident in the mine, they were taken home in this black covered wagon. And all the women would have a fear when they saw this black covered wagon coming down the road. Women who had men in the mine always lived in terror." "Miners took a lot of chances and had bad casualties. You knew you were taking them, but you had to make your living." "My grandfather died in a dump cart on the way home from the Drummond in a blizzard. He'd been buried under a fall that broke his shovel and drove the handle into his groin." "The day I was starting underground, I was getting my belt and my canvas cap when they took a man off the cage, dead. I was a pretty scared little boy, but I couldn't chicken out." "We were boring holes when suddenly my steel broke, so I had to go for another one. My brother followed me out, and God Almighty, when we came back there were three tons of coal down and we couldn't see the face at all. If my steel hadn't broken - and why did he come with me? I only went for a few minutes. Some funny things can happen. That was an Act of God. You know, they'd never have found us: we were way back behind the chucks." "It's fight the fires or lose the mine." 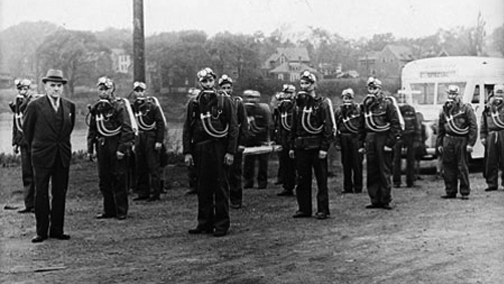 In 1911 Acadia Coal acquired breathing apparatus and began training mine rescue workers. Thus was born the Acadia Rescue Corps, popularly called "draeger" men after the German company that manufactured the early equipment. In 1913 a fire in the Albion burned for 16 days before being finally extinguished. Draegermen wearing fire-fighting equipment directed groups of barefaced miners with hoses in front of scorching heat, debilitating gas, and great balls of fire that came rolling towards them. "Once when there was a fire smell in the MacGregor, we decided to take the equipment out, and get stoppings built. The overman went up to get materials and men. This young fellow stayed down with me. It was all crush back there, absolutely full of gas. We started making little snowballs with stone dust and water, squeezing them in to stop the flame coming through the holes. When they came back we didn't worry about the tools, we just built the stoppings and cleared out." "I went to the Albion to bring my father his lunch. He hardly came home during that fire. He was lying on the floor, with some old clothes under his head. I shook him. He only grunted. I thought he was half-dead, but another fellow reassured me: `He's just sleepy. Don't worry. That's how the afterdamp will affect you.'" "One time when we were building a stopping, every now and again the fire would hit a little pocket of gas, and would burst out bigger. The chips would roll along the bottom, with the gusts. The old fellows kept right on working, not even letting on that anything was wrong." Over its tormented 47-year lifespan the Allan shaft exploded eight times. 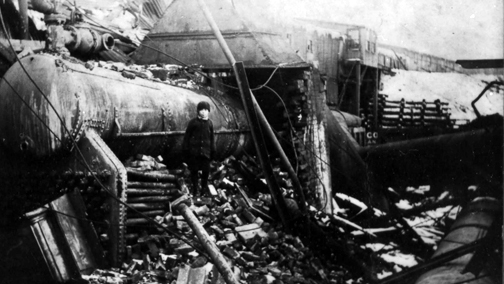 On December 20, 1914 the first explosion killed two. An omen? 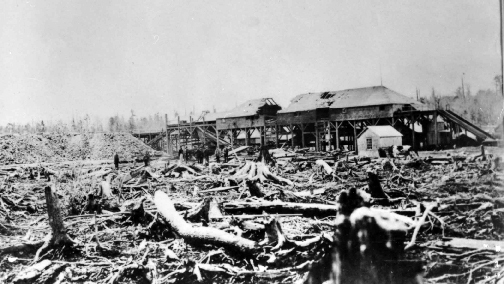 On January 1918, a massive blast devastated the whole pit. 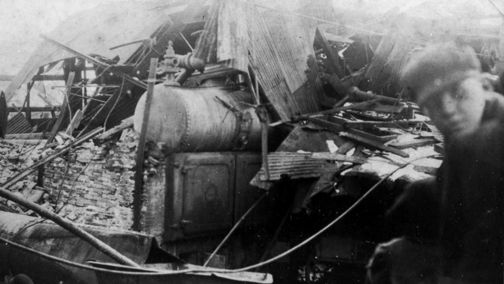 On June 30, 1924, four men died in yet another Allan Shaft explosion. In its last outburst – April 28, 1950 – the Allan was merciful. All 77 men underground escaped, except two who were later rescued by a draeger team. When the Allan was sealed over the next year, the community was thankful its long war with the treacherous Foord seam was finished. "88 were killed. One funeral - there were five caskets in that church. The church was packed to the doors. There were several weeks between when the bodies were found. I remember going to see a man's remains, and his face was black. The coal dust was driven right in it. The whole town was in mourning; you could never believe the effect it had on people." 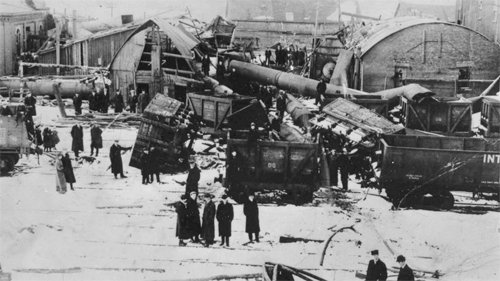 "The explosion travelled so fast, and was so hot... Iron rails, 45 gallon drums, longwall pans, she moved them, no trouble at all." "It picked me up and threw me like a rubber ball. I put up my hands to protect my eyes; my hands got all burnt: the fire went right over top of me. It was all smoke and dust, I had to feel for the pit frog to find direction." "If there was trouble in a mine - a fire or men trapped- you considered it an honour to go down. In that '56 explosion at Springhill, when I went down Number 4 Mine, I wasn't sure if I was coming back or not. But there were men there to be saved, and we had to take those chances." "As we were getting on the cage in 1950 a little girl who was standing there with her mother reached out to me. `Please bring my Daddy back.' We had found all but two, and were stumbling around in the smoke and dust, 4700 feet from the shaft bottom, fires were burning, we could hear the rock running. I was thinking it was probably hopeless, then I remembered that child. We kept on, and found the last two men, half-conscious. The mine exploded again barely an hour after we got out." "The old draeger machine had those helmets that they pumped up around your face so it was airtight. Your face would swell in the heat, and it would pain. Big Tom Scott, his helmet fit me perfect; I would be waiting for him to come up. I'd dump the sweat out of it, and slap it on my face."